"You know, I think we're from two different worlds. How could we ever get along with each other?" MPAA Rating: R for language, drug content and some sexuality. Beginning in the 1980s, the moribund Taiwanese film industry underwent a renaissance of sorts, with such directors as Ang Lee, Edward Yang, Tsai Ming-Liang, and Hou Hsiao-Hsien. While earlier Taiwanese films had mostly been poor imitations of Hong Kong martial arts movies and family melodramas, this new generation, steeped in European art-house and auteur films, has created a fascinating body of work. Ang Lee's certainly the best known, with his smash hit Couching Tiger, Hidden Dragon and the sublime The Ice Storm, one of the best films of the '90s, while Hou's oeuvre remains mostly unknown, especially in the U.S.
Perhaps it's due to the perceived "difficulty" of his films that none of them has been distributed theatrically in the States, or maybe distributors don't think that his usual themes—Taiwanese identity and history, and the alienation of youth—would appeal to the art-house crowd. Certainly, viewers accustomed to an easy viewing experience, where everything is spelled out in detail and the plot moves along quickly may find his films frustrating, even boring. Millennium Mambo is Hou's portrayal of Vicky (Qi Shu) and her on-again, off-again relationship with Hao-Hao (Chun-Hao Tuan). As an unnamed narrator tells us, Vicky has broken up repeatedly with him, but always comes back, telling herself that she'll leave him for good when the $500,000 she has in the bank is gone. Hao-Hao's not exactly the ideal boyfriend, clinging and suspicious of her every action, to the point of examining her phone bills to see whom she's called. He regularly invites his friends over to get high, while Vicky spends her time cleaning up after them, and he doesn't work, preferring to hang out and practice his DJ skills. The two fall out, and Vicky begins to spend some time with the older Jack (Jack Kao), as well as the half-Japanese, half-Taiwanese Takeuchi brothers. Jack treats her like a friend, and he's caring and comforting, unlike the incessantly argumentative Hao-Hao. But he's also involved in some shady deals, which will ultimately lead to a forced stay in Japan. Hou's regular collaborator Chu Tien-Wen wrote the screenplay, and it's extremely naturalistic. Instead of the usual expository dialogue, where characters explain the plot and their backgrounds, people here speak as in real life, with overlapping sentences, hesitancies, and unanswered questions. Entire scenes are structured realistically, with characters coming and going, and the end result might be difficult to appreciate, save for the narration. It's from the unknown narrator that we learn the necessary plot details, the repetitive nature of Hao-Hao and Vicky's relationship and the back stories of the characters, and this allows Hou to film in a style that gives the audience the impression of eavesdropping on reality. Working against the realism of the plot and dialogue is Hou's visual style. Favoring a static camera and long takes, he's often compared to the Japanese director Ozu, but this comparison is only apt for certain of his films such as The Puppetmaster, with its many interior scenes of rooms and corridors. Even in his masterpiece, The Flowers of Shanghai, which contains no exterior shots at all, Hou frequently moves the camera, often tracking sideways to concentrate on whichever character is speaking. 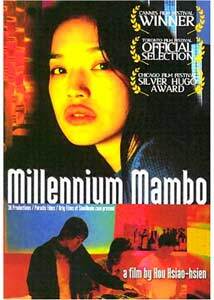 In Millennium Mambo, his style is less formally restricted. He still favors long takes, often with unbalanced compositions, but the camera here is more fluid, panning and tilting to follow the action, or sometimes simply concentrating on a visual detail. He's certainly not taken the easy route of making narrative-driven choices, and once again the clarity of the story allows him to depart from the norm, and create a film that's visually imaginative and intriguing. Hou's films have historically had their detractors as well as admirers, and some of his works do indeed seem unfocused, almost arbitrary in their execution. At his best, he's an original, fascinating director, creating films that are beautiful and sublime. Millennium Mambo falls closer to the latter than the former, and those attuned to its narrative and visual strategies will find much to like here. Image Transfer Review: Previous DVD releases of Hou's films have been poor, with substandard transfers that don't to justice to this extremely visual director's work. Thankfully, Palm's anamorphic transfer is great, allowing not only the neon colors of Taipei's nightclubs, but also the more subtle skin tones to shine. There's a lot of image detail, and no compression errors. Audio Transfer Review: The Dolby two-channel sound is quite good. Lin Qiang's excellent techno-fuelled score comes through well, and there's lot of range and bass. It's a major disappointment, then, that both the five-channel Dolby and DTS tracks are simply copies of the two-channel sound, and are absolutely silent in the surround channels. This would have been an 'A'-grade transfer otherwise. Extras Review: A much longer (13m:25s) version of the closing sequence is included, and it's significantly different from the finished version. The original ending is much more explanatory and ties up the loose ends in the relationship between Jack and Vicky, but Hou made the right choice, as its ambiguity contributes significantly to the film's "slice of life" impression. The transfer is nonanamorphic and black levels are terrible. The interview with Hou is also nonanamorphic, but looks quite good. Over the course of its 8m:51s, he explains his inspiration for the movie, his avoidance of dramatic story lines, and talks about his actors and the score. Despite its short running time, this is an informative and entertaining interview. Two original trailers are included, one with burnt-in English subtitles that replace the voice-over of the film, and one with Chinese text. They're nonanamorphic and well-presented despite the weak black levels. The five other trailers for Palm releases are presented sequentially (whatever happened to menus and a 'Play All' option? ), in mostly good transfers. The DVD's packaged in a clear keepcase, with a printed chapter listing visible from the inside. Hou Hsiao-Hsien's latest work is a visually striking portrayal of the on-again, off-again relationship between two young Taiwanese. With its languid pacing and off-kilter visuals, it won't be to everyone's liking, but viewers willing to put in a bit of effort will be amply rewarded.